Wind Turbines at Lamberts, Barbados – How close is too close? Back in 2007 when BL&P’s proposed wind turbine installation at Lamberts was a relatively new topic, many good folks sent us information, articles and photos. We opened a folder, started some drafts and intended to do a series on the project, but then we had a computer meltdown that lost everything including the wind power files. One thing led to another and we never did recover the files or complete the wind power series – but Shona found the lost files last weekend! It just goes to show you. In September 2007, Clive burned a CD with some article ideas and brought it to one of our Friday meetings. We took it home and it’s been sitting in a pile of “stuff” on the bookshelf for 3 years. (I know, I know. I really should do a better job of arranging my office.) On that CD was a copy of the wind power materials that we thought were wiped out by the crash. Some of it might be a little dated now or eclipsed by events, but we hope that publishing the materials now will inspire some discussion in light of the current “Green Economy” push by the Barbados government and the renewed interest in the wind farm proposal at Lamberts. As you can see in the photo at the top where the turbines are creating a vapour trail much like an aircraft at high altitudes, wind turbines are not beneign – they have an impact upon people, environment, economies, land values and so much more. Can we predict all impacts and mitigate the bad while keeping the good? That’s a question that deserves open discussion by a well-informed populace. Barbados Free Press previously published two three wind power articles that I can find right now. 1/ November 14, 2006 Barbados Wind Farm Question: What About Low Frequency Noise? Canadian company Emera Inc. to buy 38% of Barbados Light & Power Holdings Ltd.
.. Chris Huskilson, President of Emera Inc.
What will the Emera Inc share purchase mean to ordinary Bajans? Emera Inc. is a Halifax, Nova Scotia based corporation with it’s main investments and holdings in electricity generation and pipelines in Canada, the USA and the Caribbean. If you check out their website you’ll see that they also have interests in alternative energy companies including wind farms, hydrogen and tidal power generation. 38% of BLPC is a fair chunk of shares and Emera didn’t purchase them without expecting a good return on the investment. Let’s hope that any increased profit-taking from the pockets of ordinary Bajan consumers will be offset by the increased knowledge and technology that Emera brings to Barbados. Frankly, if we could be assured that Emera’s participation means that every time we turned on a switch we would receive nice clean power with no computer & TV-killing spikes or surges – then we’re all for the Emera Inc. deal! 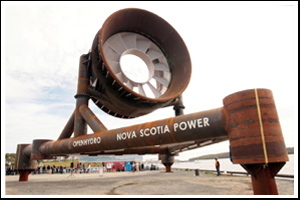 Emera Inc. has interests in alternative energy sources including using tidal flows to generate power. Press Release Emera to Acquire a 38% Interest in Light & Power Holdings Ltd.
We can think of the bio-diesel project and one man who spent $60,000 equipping his home with solar and wind generated power but not much else. 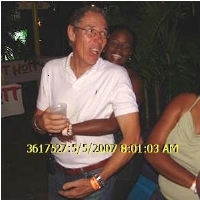 Perhaps it is time for Bajans to bite the bullet about wind farms, and then stand aside and let Bizzy and his team get on with it. Bizzy is a man who can actually make a large project like this happen. We can have another year of talk, talk, talk or let Bizzy do, do, do. Question to all bloggers. Should Barbados pursue wind generation of electricity? If so would the high ground to the East of the new recycling center at Vaucluse be the right place for the wind turbines to be erected or should Government grant BL&P permission to build a wind farm at Lamberts? Or should both sites be used? Bizzy Williams, Williams Industries Inc.
Why not harness the wind? 100% Energy: Any man of Bizzy's age who can party until 8am has our respect! Last Friday ‘Bizzy’ Williams visited Barbados Free Press and asked our readers about wind power. While there are concerns about where to put wind farms, we at Barbados Free Press believe that this country must embrace alternative energy sources – and that we need leaders like Bizzy to make it happen on a large enough scale to be effective. Barbados has lots of energy just waiting to be captured: wind, sun & tidal – but without people like Bizzy who actually make things happen on a daily basis, this will be just so much talk. Who would you rather see implementing wind power in Barbados… one hundred politicians and bureaucrats in a room discussing what colour the towers should be, or Bizzy Williams and crew saying “Get de hell outta de way! Let’s get it done!” ?